One week later, we’re still reeling with Post-ENDURrun Syndrome (PES). The best way to combat that is to send some thank yous out to the individuals and groups who make this project so much fun. This particular moment is one of the high points in the history of ENDURrun, and so here’s a toast to the ENDURrunners community that make this 2018 featured photo possible. Charity isn’t a big focus at ENDURrun, but that doesn’t mean it’s not important and that there aren’t incredible stories from our fundraisers. Shattering all previous standards, Josh Bohnen for Nutrition For Learning, Maria Michel for KidsAbility, and Anne Hinds for Guelph-Wellington Women in Crisis collectively raised over $15,000! Did you notice Health + Performance out during the week? Of course you did, because H+P had a massive week. Head coaches Sean and Gillian rallied 70+ athletes in total, and facilitated massive course support each Stage. H+P swept the women’s podium (and 4th too!). And with 11 (!) relay teams, it’s hard to summarize everything, but their Women’s and Masters’ teams set all-time ENDURrun records, and the Funatics bested their 2016 selves too! Runners are out on the course for about 15 hours, but our friends at KW Health Connection are at the tables for more than that and can’t be thanked enough. Don’t be shy to book an appointment, stop by, and say thanks! CCMH Cambridge too! We at @kwhealth are happy to help ALL athletes from @RunWaterloo with your training and injuries. The Running Rarebits were there every day, with multiple Ultimates and relay teams, volunteers, and pop-up aid stations. And their branded relay team bested their 2017 time by six minutes! Thank you. The award for using ENDURrun how it was designed goes to Guest/Relay runners Antoine Gauthier, Reza Saputra, Mitch Wilson, and Bryan Yeung, all of whom ran Stage 5 this year ahead of their Rookie campaigns in 2019. Wise moves gentlemen! 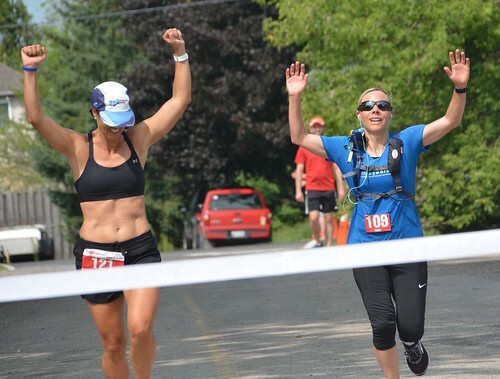 Also notable is pacer Diane Lacombe who also got a great taste of ENDURrun in 2018 and is entered as a Rookie for 2019. These components of ENDURrun (Guest, Relay, Pacer) are designed to add value to the community, but also to drive future Ultimate participation. Stay tuned for “July” soon. 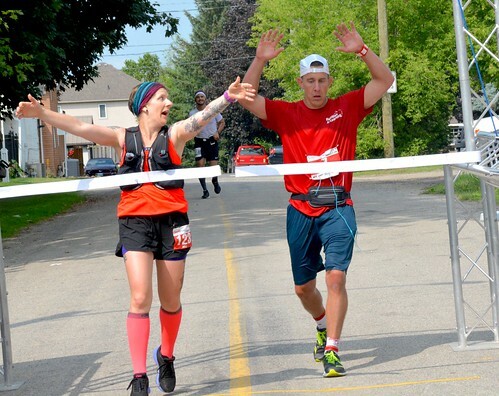 We can’t forget our 2018 winners, Robert Brouillette and Valery Hobson; both great stories whether you’re battling ghosts of ENDURrun past, or in an epic battle with another phenomenal athlete. Robyn Collins also joined the Golden Club this year, and even though her 5 Stage wins left her 6 minutes shy of an Ultimate victory, her positive attitude about the whole experience is ENDURrun. ENDURrun is sometimes described as a fun week with some running thrown in. Big thanks to everyone who planned and organized socials, hung around the pool, and stayed late at Stages to make Rookies feel welcome. Some exceptional cases of a last minute entry from 18 year old Conner Krofchick and our 75 year old Ken B Anderson who almost made it. In falling short, Ashley Sametz came closer than anyone ever had to the 160 KM. If you had a cold drink from one of our coolers, thank Stefan and Shoppers’ Drug Mart Elmira for that one. If you took a gel at all, kudos to Geoff at Runners’ Choice. Kit swag was courtesy of Saucony Canada. That poster souvenir is thanks to M&T Printing Group (and your autograph cramp). Huge thanks to Mike Hewitson for not wearing a gold shirt this year. To the neon shirts, how do you do it? Too many to name, but our outgoing food crew, the timers, setup, cleanup, marshals, water, and web team are top notch. Just the fact that you can look up historical results is a minor miracle. As a testament to the excellence and personal growth that we idealize, look at the historical results of runners like Rebecca, Ian, Wilf, and Valery for inspiration as to how much individuals can and do improve at this event. Outstanding Rookie performances from Robyn and Aidan Rutherford prove that anything is possible. (5 of these 6 athletes are coached by H+P). This was REALLY cool, but now we’re spoiled and William Spaetzel is signed up for 2019. Hmm…maybe Chris Mintz can fill in. Oh wait… Sue Wemp? What is going on?? ?